The first China-Europe Chang'an freight train (Xi'an-Budapest) arrived at the BILK Railway Station of Budapest, Hungary on April 7 after an 11 day journey, setting a new record in the time taken on the Budapest route of the national China-Europe freight train platform. Departing from Xinzhu Railway Station in Xi'an International Trade and Logistics (ITL) Park on March 27, the time limit of the freight train (Xi'an-Budapest) was shortened by three to five days compared with the previous China-Europe freight train. The freight train passed through Kazakhstan, Russia, and Ukraine, before arriving in Hungary 9,653 kilometers away from its departure point, carrying auto parts, medical supplies, daily necessities, and other products. As one of the EU member states, Hungary is the first European country to participate in the Belt and Road Initiative (BRI). Hungary has now become China's largest investment destination and the third largest trading partner in Central and Eastern Europe, while China is Hungary's largest trading partner outside the EU. The stable operation of the China-Europe Chang'an freight train (Xi'an-Budapest) will further extend the economic and cultural exchanges between the two countries, promoting sustained and steady growth in bilateral trade. Relying on the Chang'an international freight train logistics hub, ITL Park is making efforts to build a Belt and Road inland international transit hub, a trade and logistics hub, and a new center in the eastern part of Greater Xi'an. 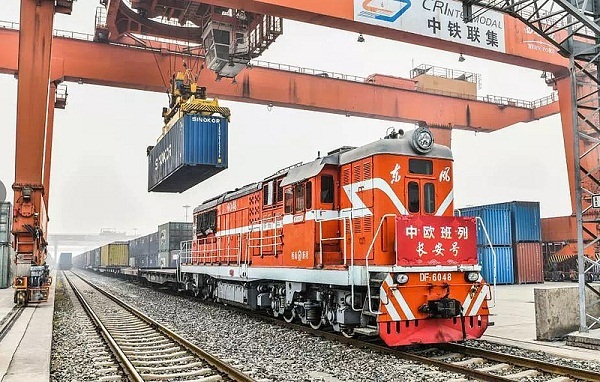 In the future, ITL Park will strive to reach its goal of operating 1,800 China-Europe Chang'an freight trains in 2019 to strengthen the cooperation between Xi'an and Xi'an Port with the inland provinces, coastal ports, border ports, and major enterprises.